Figure 38.1. The Binding Site SPAPLUS. The Binding Site SPAPLUS is an automated, bench top, random-access turbidimeter (Figure 38.1). All Hevylite specificities are 15 minute assays. Hevylite calibration curves are made from a set of six calibrators, and are validated using two control fluids supplied with the kits. If a Hevylite result is outside the initial measuring range at the standard dilution (1/20 for IgG HLC assays and 1/10 for IgA and IgM assays), the sample is automatically re-diluted by the instrument. Assay parameters define one higher or one lower automatic re-dilution; very high level samples may require further offline dilutions. Hevylite assays have good analytical sensitivity and within-run and between-run precision . Performance characteristics are summarised in Table 38.1. 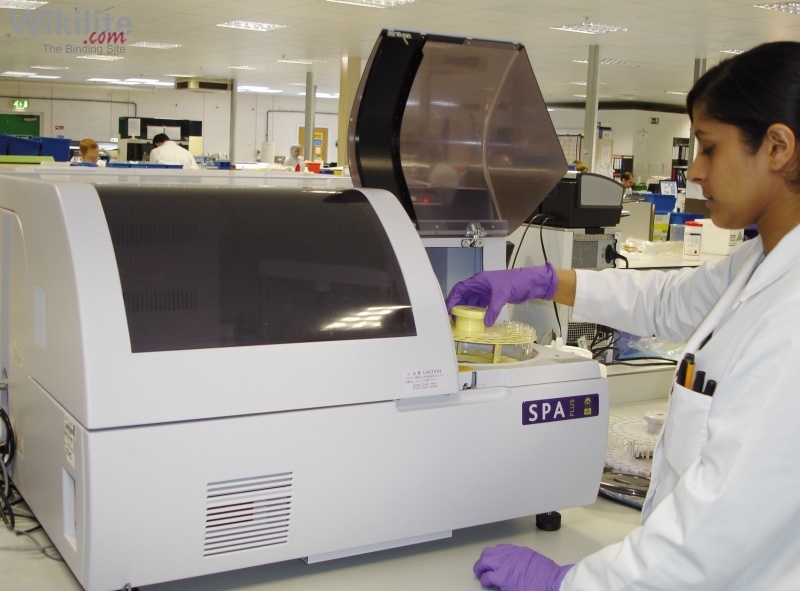 A particular advantage of the Binding Site SPAPLUS Hevylite assays is their wide measuring range. In comparison with the Siemens BNII, SPAPLUS assays require fewer dilutions to reach the upper limit of the reportable range. Measuring ranges are discussed further in Section 9.4.3. Table 38.1. Hevylite assay performance on the Binding Site SPAPLUS analyser. Antigen excess (prozone) parameters exist for IgMκ and IgMλ Hevylite SPAPLUS assays, and are discussed further in Section 11.4. Samples detected as being in antigen excess are automatically flagged by the instrument with a prozone (P) flag and the sample is automatically re-assayed at the higher re-dilution.